hmm...i wonder what he wants to be for halloween! by now madalyn is nearly three months old, but i wanted to update on her 2 month appointment. she is growing like a...flower (we don't like the word weed around here...to many weeds in the yard)! she passed her milestones with flying colors and her pediatrician was very impressed! and i must say, i was really impressed with her pediatrician. i think i finally found someone i like. dr. edwards at the pediatric center does an amazing job. while he was examining her it felt more like he was just playing with madalyn while having a little conversation with her. she is cooing like a bird and smiles quite a bit (especially when her daddy talks to her). she follows objects with her eyes and has good head control. she doesn't mind her tummy time, the boys call it her tummy exercise. and in just the last week she has started sleeping 8 hrs at night. i love that. this stage comes and goes way to FAST! this summer kevin was reunited with one of his old games he had growing up (his parents are trying to clear their house out before they move from illinois to utah this winter). they boys got it out the other night to play. owen and wesley loved it and kevin was filled with good memories of playing this with his dad as a young boy. of course owen claimed the blue team (blue is his favorite color) and wesley was the white team. wesley likes to call them the "good guys" and the "bad guys". wesley had been feeling a little left out each sunday when kevin and owen put on their white shirts and ties. so, a couple weeks ago i bought wesley his own white shirt and tie...and he was THRILLED! 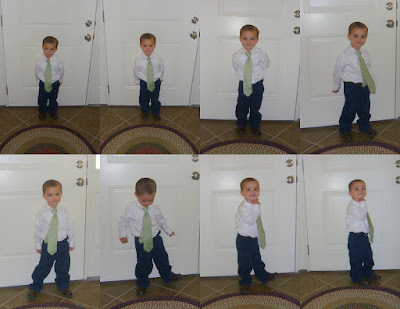 when we dressed him for church kevin decided to take some pictures and wesley went all out and put on his own little modeling show. i thought the sequence of pictures that kevin took were priceless. so, i am sharing them. don't you just love his "GQ" pose at the end. what a little poser! anyway, earlier this spring we sunk a trampoline in our backyard and mapped out a play yard for our kids. and when the guy came to dig the hole for our tramp (and level out our yard) we also had him dig out a section for the play yard so it would be a little be lower than the lawn. we bought a swing/play set which kevin put together himself (not sure he will ever sign-up for that again). then we had to move dirt back into our play yard because we dug it too low and it would have cost WAY too much to fill it with something else. then we had someone come out and put some edging up for us. let me know if you ever want edging done and i will tell you who NOT to call. we laid down the weed barrier and then bought some rubber mulch to fill it with. we finished it about 2 hours before my family came over for the byu game on saturday and the kids LOVED it. the next day, after the baby blessing, we had about 22 kids playing on it. that made all that hard work worth it seeing all those kids out there having fun! and, what was even better is that the play yard survived. the boys enjoy playing out there. we have even had lunch out there a few times. now, onto the lawn. we are hoping to get some seed down before the ground freezes. wish us luck! we spent labor day with kevin's sisters and went to the eastern idaho state fair. we bought the boys some tickets for rides and they were less than interested in any of the rides. we did convince owen to go on the "roller coaster" and he looked TERRIFIED as they whipped around and around. so, laura and rosanne and myself used the remaining tickets and rode on the swings and we all thoroughly enjoyed that ride. owen on the "roller coaster"
wesley LOVES to pretend he is a SUPER HERO! he is constantly asking us to tuck his blanket into his shirt so he can "fly around". in pursuit of the "bad guys"
"dad, i drew a picture for you!" "now, get me that magnet from the fridge." "let's put it right here!" we blessed madalyn this past sunday. she was such a good girl ALL DAY LONG, especially during her blessing. she looked beautiful in her blessing outfit and received a VERY special blessing. standing in her blessing circle: her dad, her grandpa manwaring, and her uncles chris, jarom, justin, blake, ben, brandon, and kyle. after church we had a everyone over for some lunch/dinner and visiting. we were so thankful for all those that came out to support her. i didn't take any pictures, but i did discover a couple that owen had taken that i thought were blog worthy. my baby girl, madalyn, was given a name and blessing this past sunday by kevin at our church. i always love these events...especially when they are for my baby. because madalyn is my first baby girl i really hadn't paid attention to the tradition my grandmother,mom, and sisters had concerning "THE" blessing outfit. but, as i was talking to them all about finding a blessing dress a month or so ago i was REMINDED of "THE" blessing outfit. i really don't know why i hadn't paid attention to this before in the past...but, they had my attention now. for my mother's blessing day she was given little booties that were crocheted by her grandmother, kathryn harding. they are the most delicate and beautiful little booties i have ever seen. my mom put these booties on each of her five daughters on their blessing day as well. AND my sister, katie, (the only sister to have little girls..besides me now) put these little booties on all five of her daughters on their blessing day. so, as tradition goes (TRA-DI-TION...TRADITION!...and i love tradition) i put my little madalyn in these booties on her blessing day. 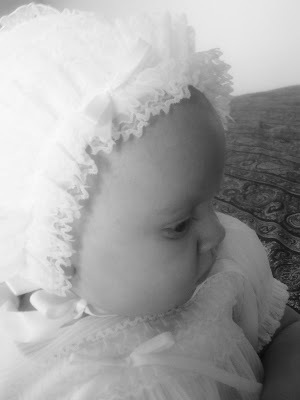 when my mom had her first baby, katie, she went out and bought a beautiful blessing outfit for her to be blessed in. knowing that she would be using it for all her daughters (but, i am sure she didn't realize this would be FIVE) she paid quite a bit of money for it and freaked my dad right out! she told me she paid $35 for this dress, which back then was what they were paying for rent each month. now, dad. isn't that the best $35 you have ever spent? all five of us daughters were blessed in this outfit. katie's five daughters were blessed in this outfit. and...madalyn was blessed in this outfit. and now, as tradition goes, i have wrapped these priceless items in their blue tissue paper and placed them in their blue box so they are ready for the next little princess. wesley is quickly picking up on owen's habit of sleeping with toys. the other night he requested TWO stuffed animals. the boys crashed on my bed the other night while watching a show and waiting for dad to get home from work. don't they look so relaxed! the first weekend of september kevin's brother, sam, and his family came to visit us from logan, ut. we love to have company...and the boys loved spending time with their cousins. they were also able to meet their newest niece, madalyn. lisa rocked her right to sleep. it was a quick visit, but it was nice to catch-up.